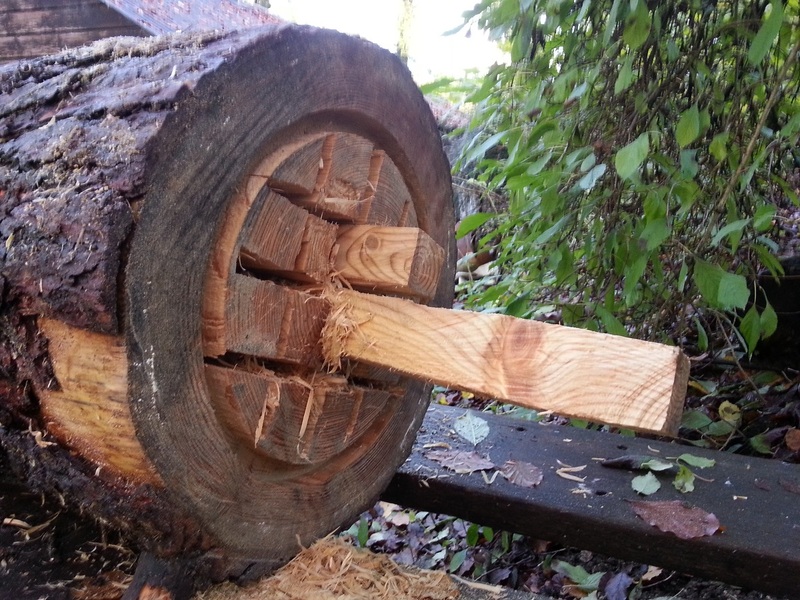 In this post, I describe how John Haverson and I made the log hives : using fire, chainsaw and gouges. Without any special tools we began by using fire to help hollow the log. 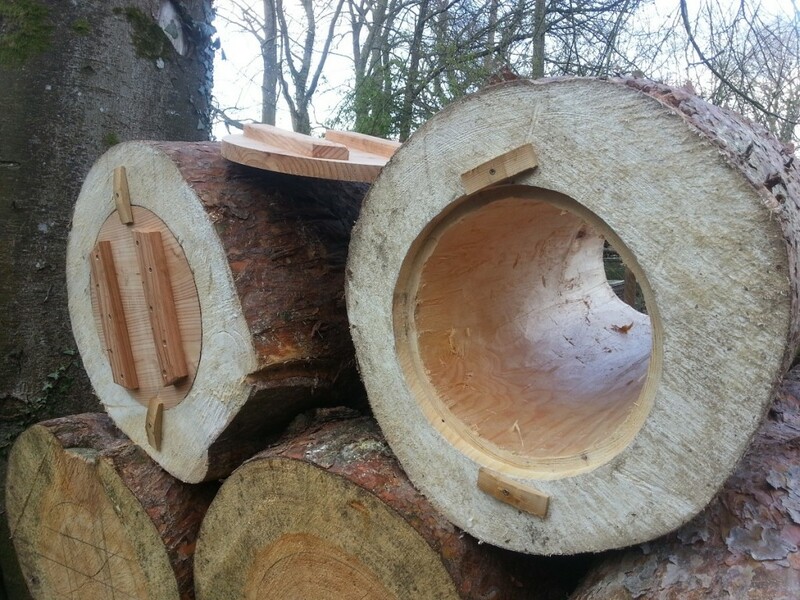 The logs typically are between 32- 36″ long with a 12″ hole. This leaves plenty of wall thickness, needed for insulation. 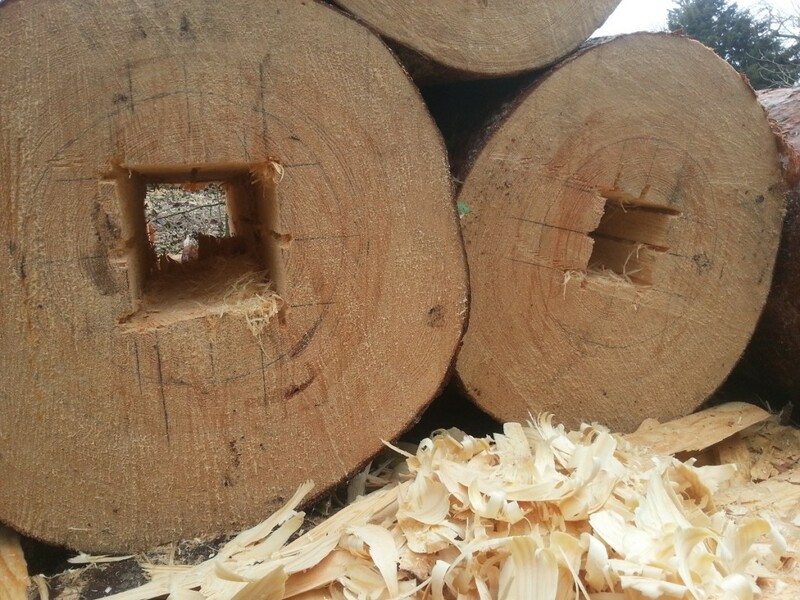 We started by drilling a small hole through the log, working from both sides and hopefully meeting in the middle. 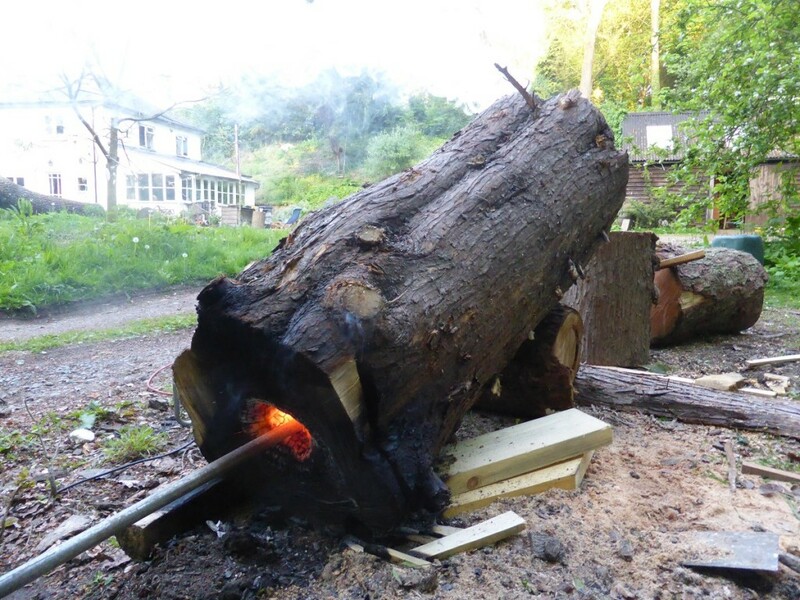 Once the hole is made , the log is tilted and a small fire lit at the base.The speed and direction of burn is enhanced by air fanned through a metal pipe. Below shows the log, hollowed just using fire. Work was then needed cleaning the charred sides, in preparation for the bees. 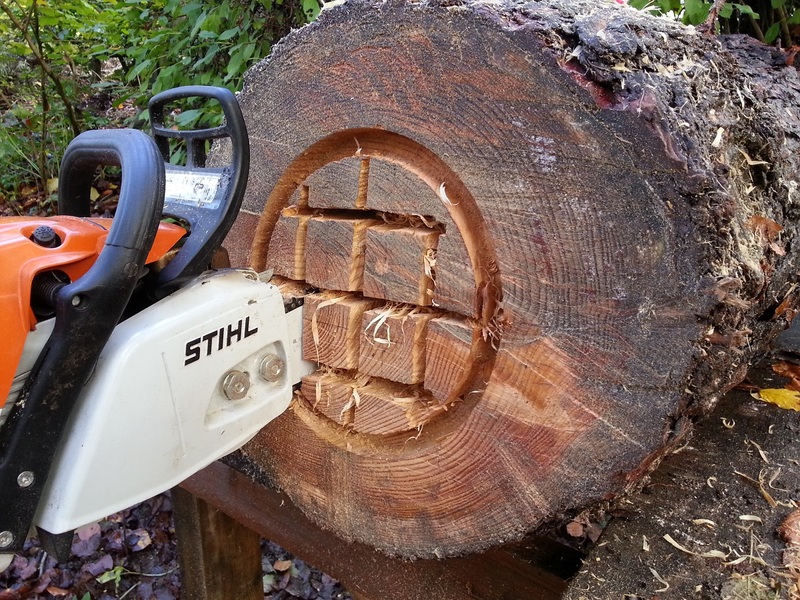 The cleaning of the log was time consuming, so a new method was tried using a chainsaw and gouges. The saw, which had a long blade was plunged into each end, cutting a grid through the timber. These long squares could then then be pulled out, leaving a square hole. These are some logs after chain sawing, the picture shows the 6″ square holes and the outline in pencil of the 12″ hole. The tools below were used to cut the rest of the wood out. 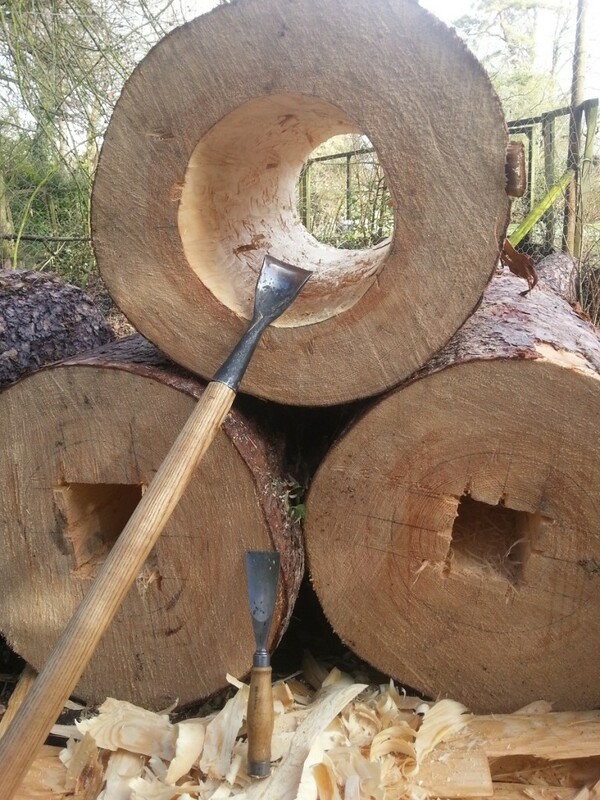 The big gouge had a 5′ shaft to help cut through the length of the log, after opening up with the hand gouge and mallet. 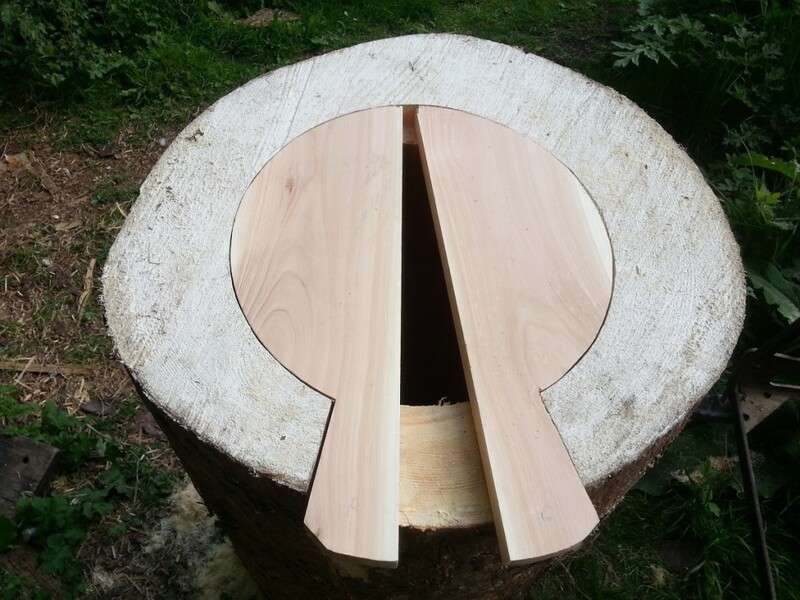 The base of the log has a rebate to accept the base board, held in with wooden toggles. The top is slightly different to accept the three part boards. Two side boards in place. A third wedge of wood holds them tight. 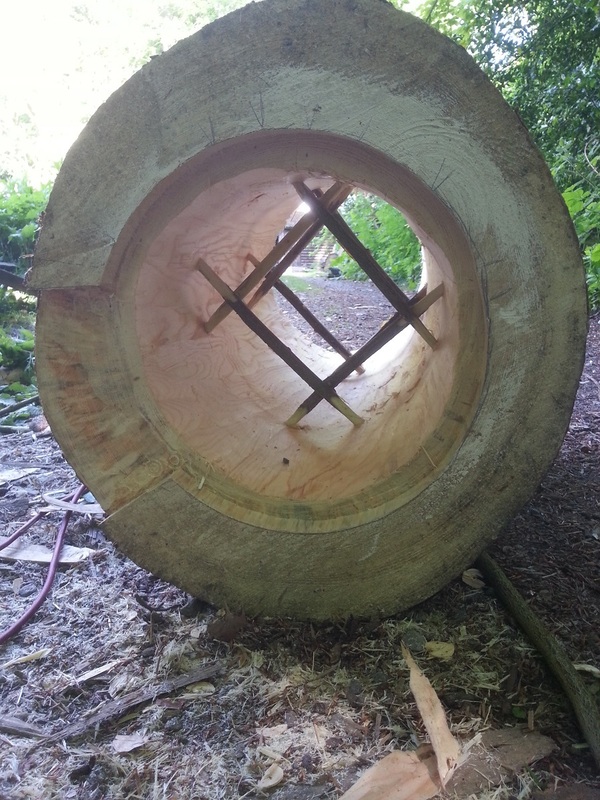 Inside the log ,two sets of hazel spales are fitted, approximately 9″ from each end. This helps support the growing comb and separates the cavity into three parts. If any honey is harvested, side combs are taken, but the central part with the brood cluster belongs to the bee. 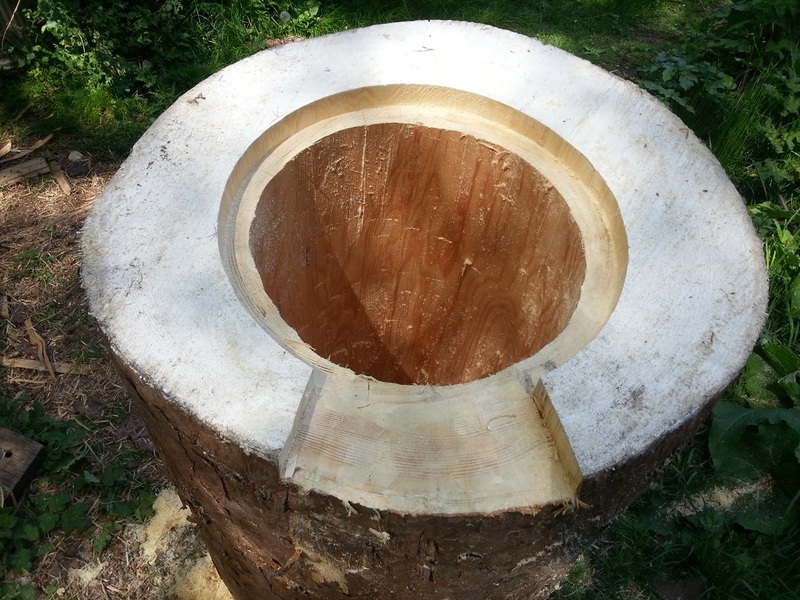 Finally after 3 entrance holes are drilled near the base the log is made ready for the bees. 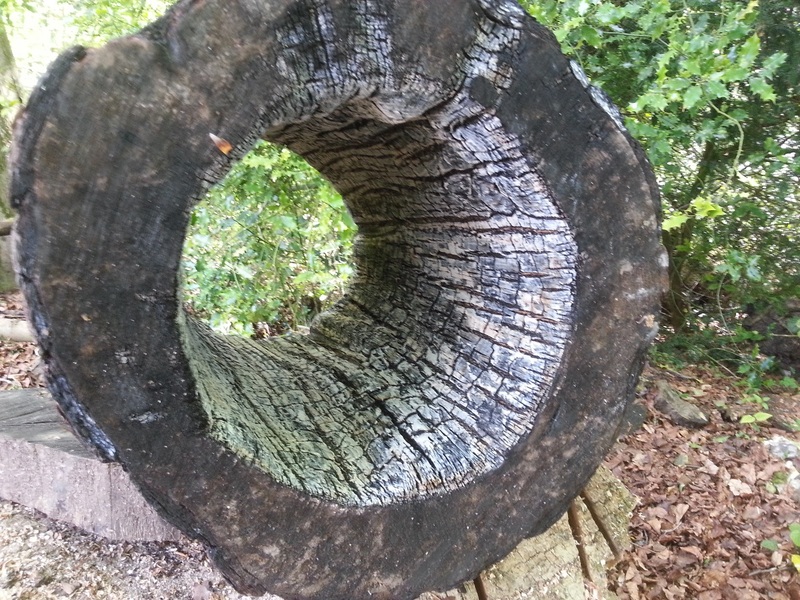 This log has been hoisted into an oak tree. The hive is baited with old comb, wax and propolis to smell of bee. I was pleased that scout bees found this log, liked it, and moved in after only ten days. Here is a “land log” just populated with a strong local swarm. 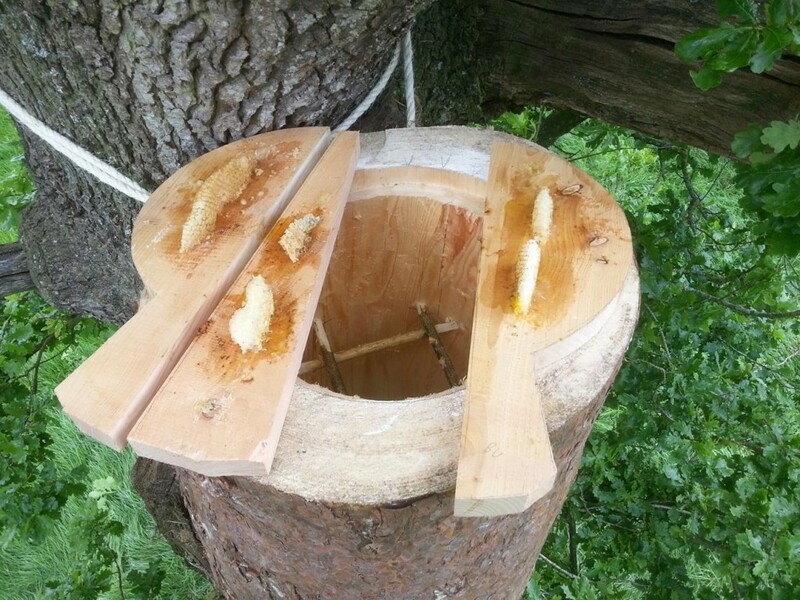 Logs can also be raised on legs to give a better view of the colony after removing bottom board. Well done Matt a good posting. Easy to see who did all the work with your yellow shirted ‘supervisor’! Great fotos Matt. 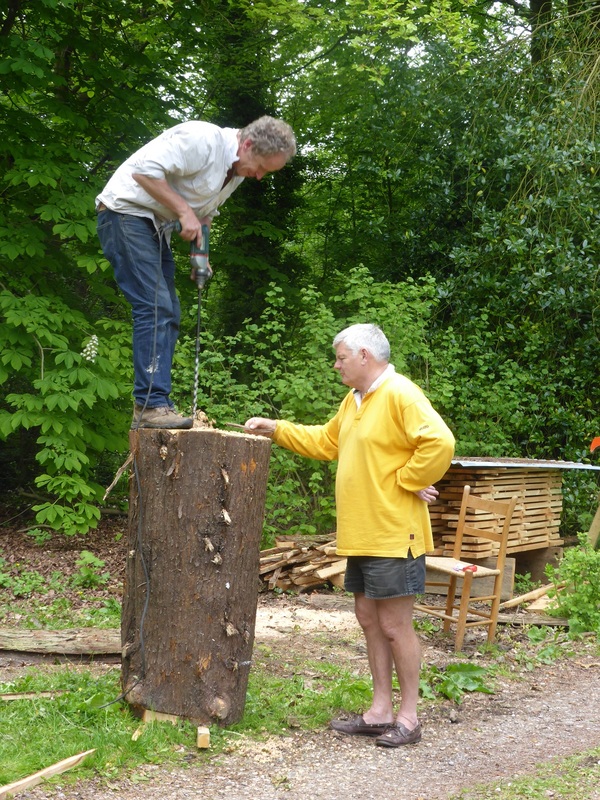 It was great to meet you at Westfield Farm and to see and help hollow out a tree log. I believe there may be a workshop in April next year, hope I can make it. Gotta admire the adz, is it called? with the 5′ long handle. I would very much like to buy one. Can you get me one, John or Matt, please? (A bloke to go with it wouldn’t go amiss either!) And then a machine to get it into the tree. I know how much hard work goes in to making one of these amazing bee homes; a lot of sweat, some blood on occasions & even a few tears as well as a great deal of pride & satisfaction…not to mention great joy when they are chosen by the girls. It makes it all worth while. of a chosen log. Is it done before you cut the 12 inch hole or after. I assume a router is used. In order to reach the conductance values you need an extreme amount of insulation on the top, after all in the wild there is the rest of the tree. That insulation will also need an air tight seal to the body of the log. So interesting and very in keeping with the environment. I was fascinated by your ingenuity. ..love the idea, but would like to ask 4 questions…-A-How could a log accumulate a 10.000 strong or more, beehive??? Can’t imagine the size of log needed to house so many???! B – WOULD NT A QUEEN BEE WONDER OFF EASILY, TO START ANOTHER HIVE AND LEAVE THE ALMOST OPEN LOG?? -C-ARE THE EUROPEAN BEES STILL THE BEST and less agressive BEES TO KEEP??? -D- WHEN IS THE BEST TIME OF THE YEAR TO ACTUALLY START A NEW HIVE? ?? ((I AM IN PORTUGAL, WOULD LIKE TO KNOW IF THERE ARE ANY ASSOCIATIONS THAT MIGHT BE HELPFUL IN GUIDING ME, PLEASE ? ))THANK YOU. Marie, a strong colony could have up to 60,000 bees and can survive in a cavity of 40 litres or more. 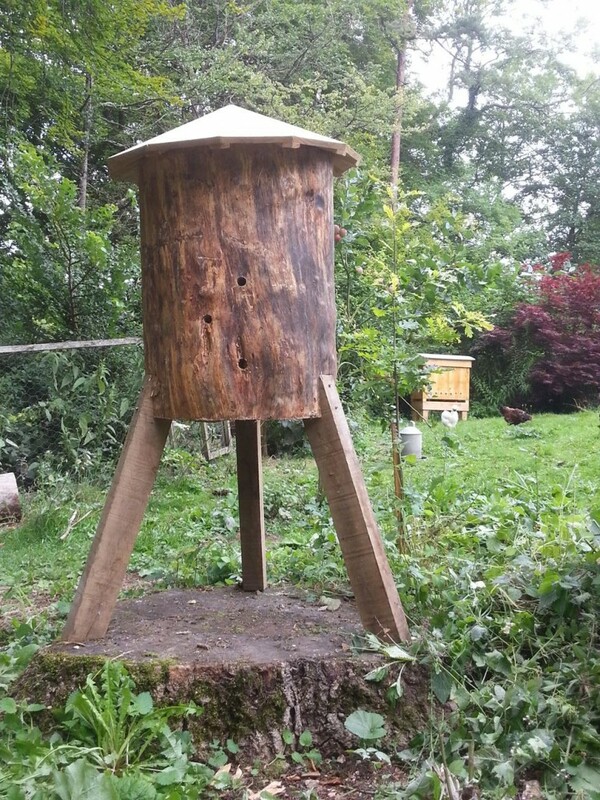 The log hive has a closed top and bottom and if dry and warm and undisturbed would be attractive to a new swarm. Finding a suitable cavity, building a nest and filling the larder is time consuming and risky so Bees move home only when disturbed or reproducing. For the Bee it is best to start a new home at swarming time, during a nectar flow – in UK usually Apr/May. Best Bee to use is you local native/near native adapted to you climate and forage; I have seen some lovely Iberian bees in the mountains of Portugal – dark bodies with grey bands. Bees are much less defensive if they are not constantly interfered with. Absolutely incredible, I love them! Thank you for sharing. Now I want one ! I’m experimenting with making these as well. I am wondering if you could elaborate on what you have done for the top space. Is it closed similar to the bottom board or left more open under the hat you have made so as to give some ventilation? Hey, I just made a log hive, but am worried about the green log getting mold, and being potentially dangerous for the bees. How did you cure your log? sorry for not replying earlier I have only just found your comment. I wouldnt worry about the log getting mould. I have only seen mould growing in Scott’s pine which happens when green as the fungi is taking the sugar from the sap. This goes as the log dries out. The bees will coat the inside of the log with propolis that inhibits growth and theree is also research that bees might also have a relationship with fungi anyway… See Paul Stamets. I have them specially made for me… at present I havent any for sale. Nice tidy job on the top and bottom there. A technique I came across, if you’ve got the saw, is to cut it vertically, gouge out the middle and stick it back together again. Hey there. I found your website by means of Google even as searching for a similar topic, your web site got here up. It appears to be good. I’ve bookmarked it in my google bookmarks to come back then. I built a log hive myself last year. Now I cant wait until mine gets populared in spring!! All log hivers are great fellows!! doing something good! 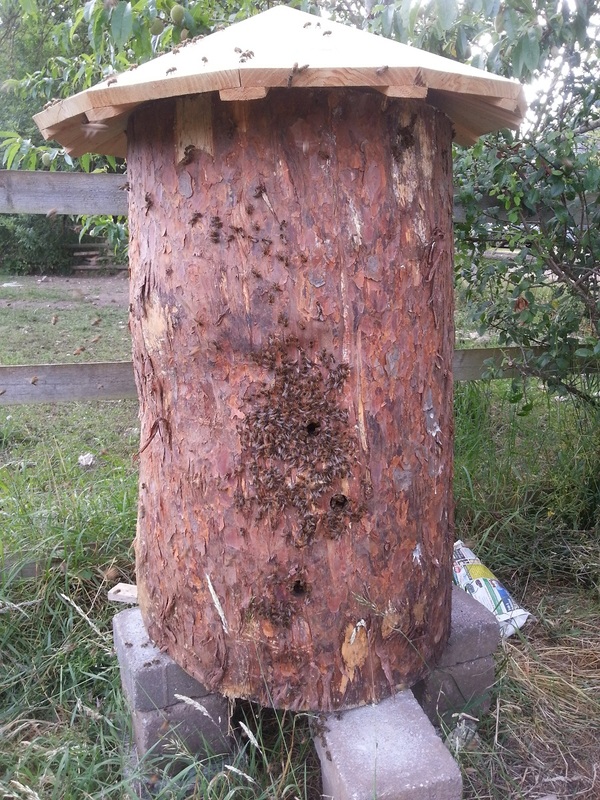 I agree, well done for making a log hive. Where are you writing from? ally I organized myself a log. The only thin I don’t seem to find is such anhuge gouge. Can you help me on that part? Just finally got myself a log yesterday. Only thing I can’t seem to find is one of those huge gauges. Could you tell me where to find one? I make the gouges and can sell you one. They are £160 plus packaging. Where abouts do you live.